Next-day delivery and same-day delivery are hot shipping topics. And they impact shopping. Their use will grow for the foreseeable future. For a long time, buyers knew mail and deliveries would take days or weeks. In fact, the U.S. Postal Service dates to 1775! Ben Franklin was the first Postmaster General. Due to limited shipping options, mail and package delivery were slow. In the past 110 years, the USPS has gained a lot of competition. Two of the best-known private delivery firms are UPS and Fed Ex. UPS started in 1907, Fed Ex in 1971. In 1964, Xerox introduced LDX (Long Distance Xerography). This was the first “commercial” fax machine. It worked over phones. Fax use soared with the development of faster-speed modems. Today, faxes are largely replaced by E-mail, texts, and other online formats. In terms of package delivery, three trends dominate. (1) Higher-speed shipping modes exist. (2)Other firms emulate the Fed Ex hub-and-spoke regional network system. (3) Resellers such as Amazon have their own regional warehouses. Throughout the latter part of the 20th century, delivery options rose. In particular, consumers could choose from three options. Regular delivery. 3-5 business day delivery. And 1-2 business day delivery. USPS, UPS, and Fed Ex — respectively — were the leaders for each of these options. And wow, Amazon Prime has grown. For instance, see the chart from Statista and Business Insider. Note: Today’s annual cost is $99. It includes streaming video and other services. 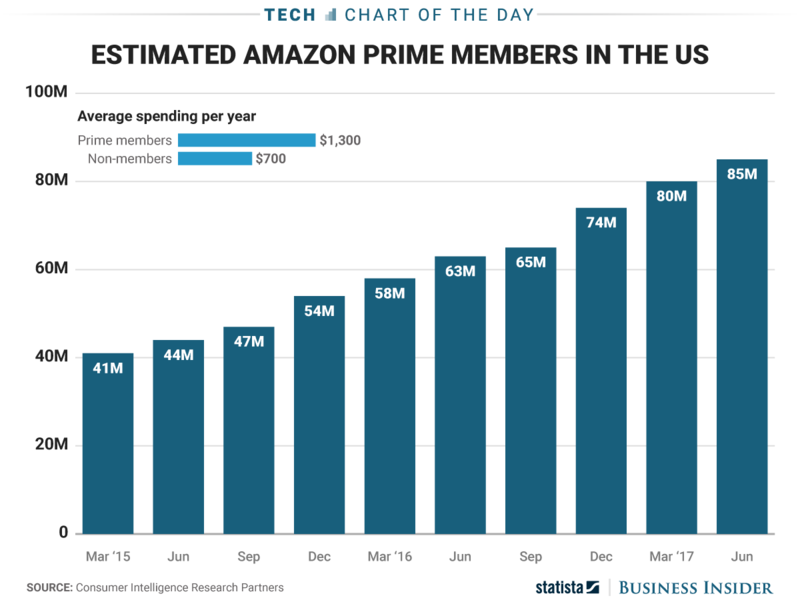 U.S. Amazon Prime members total 85 million in 2017. In recent years, delivery options have further evolved. Next-day delivery and same-day delivery are key choices. USPS, UPS, and Fed Ex pioneered next-day delivery. Today, express mail service (EMS) exists in 190 countries. EMS promises delivery in as little as 1 day. In the U.S., EMS takes 1-2 days. EMS has earned a strong following. Remember, Amazon Prime promotes 1-2 day delivery. It relies on USPS, UPS, and Fed Ex. But, Amazon keeps adding its own delivery services. Years ago, same-day delivery started at the local level. Think food delivery and prescription delivery. It took time for large firms to see the advantages. In addition, big firms found same-day delivery costs to be too high. 20 years ago, Webvan (an online grocer) began same-day delivery. It started in 1996 and went bankrupt in 2001. At its peak, Webvan served 10 U.S. cities. Most were in California. Due to high expenses, Webvan had lost $800+ million. On the other hand, we have Peapod (founded in 1989). It works with its chain supermarkets to deliver locally. It is successful. To summarize, same-day delivery is HOT! For example, these illustrate same-day delivery services. Amazon Prime Same-Day and Next-Day Delivery. In short, delivery options transform shopping. At the same time, consumer expectations soar. At any rate, we are in the on-demand economy. To this end: See it. Want it. Buy it. Then, get it immediately. All in all, no matter where we shop. Look at the infographic for a number of insights. This entry was posted in Part 2: Ownership, Strategy Mix, Online, Nontraditional, Part 3: Targeting Customers and Gathering Information, Part 5: Managing a Retail Business, Part 6: Merchandise Management and Pricing, Part 7: Communicating with the Customer, Uncategorized and tagged customer expectations, customer satisfaction, logistics, next-day delivery, opportunity, planning, same-day delivery. Bookmark the permalink.